Definition - What does Nahushasana B mean? Nahushasana B an advanced seated pose that challenges flexibility in the lower body, particularly the hips, ankles and legs, as well as the shoulders, arms and wrists. It is believed to calm the mind and improve concentration. 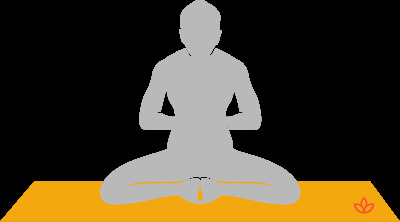 To practice Nahushasana B, begin in baddha konasana. The feet are then pulled underneath the body and twisted until the toes point backward and the perineum rests on the feet. The hands reach behind the back in reverse namaste, or prayer position, with the fingers pointing to the sky. Nahushasana B is the second of three variations of the asana known in English as the pose dedicated to Sage Nahusha. Nahusha was a mythical Hindu sage or king, depending on the tradition and legend. A common story has him elevated to king of the gods, temporarily replacing Indra, who fled into exile after being cursed. The three variations of Nahushasana are included in Ashtanga yoga's advanced fourth series vinyasa. In the B variation, the drishti, or gaze, is toward the tip of the nose or the ajna chakra (between the eyebrows). Nahushasana A – the crown of the head drops back as the neck and back arch and the hands reach behind to touch the ground, opening the chest. Nahushasana C – with the back perpendicular to the ground, the hands rest on the knees, taking jnana mudra (palms facing skyward and the forefinger of each hand touching the base of the thumb).